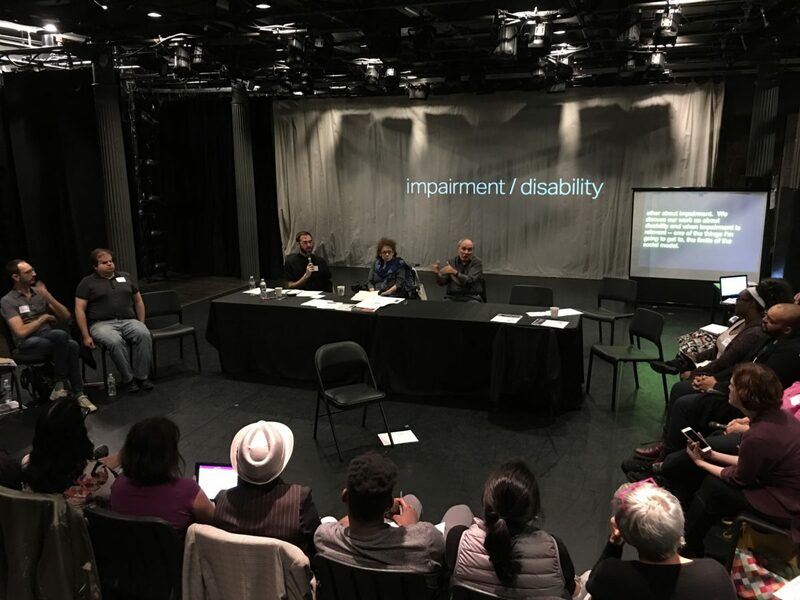 DANT and Gibney will offer a 5-day Boot Camp on disability equity in NYC’s cultural landscape funded by NYC Department of Cultural Affairs Disability Forward Fund. This project builds on DANT’s 2017 Boot Camp, funded by the Cultural Agenda Fund administered by the New York Community Trust. It will focus on preparing formerly disconnected players in all domains related to disability artistry – cultural workers, activists, and independent artists – in the fundamentals of disability studies, artistry, and arts policy. The Boot Camp has been designed by DANT Co-Directors Simi Linton and Kevin Gotkin, in institutional partnership with Gibney. We will hold the 5 sessions at Gibney, the Whitney Museum, and other NYC cultural mainstays. We will cover a range of topics, including Disability Studies 101; public and private funding of disability arts; cultural policy and legislation; interdisciplinary, intersectionality and disability solidarity; reports from various disciplines, and more. New York City has witnessed some promising developments around disability artistry in the past 2 years. During the public engagement period for the city’s first-ever cultural plan, CreateNYC, the disability arts community was one of the most powerful groups to advocate for equity, and that has resulted in a more inclusive Cultural Plan. More and better disability artistry has graced the stages, walls, and halls of the city’s cultural institutions. More people seem eager to better understand disability equity across the fields of arts and culture. Yet we recognize that despite these gains, disability arts and disabled artists remain marginalized and unrecognized. Arts education from kindergarten through conservatory does not serve budding artists well; cultural organizations, the philanthropic sector, and the city’s policy makers do not consistently evidence a strong commitment to this field; and cultural decision makers – critics, directors, casting agents, curators, etc. – are still largely reluctant to embrace this work. The Boot Camp is designed for 30 individuals who will emerge better prepared to shape strategies and best practices across the city. Thus the beneficiaries are not only the participants, but the many cultural organizations, disabled artists, and audiences which will benefit from this new cohort of leaders able to develop long-term goals and strategies. Participants will be expected to attend all the sessions. There will be reading assignments, you will be encouraged to attend performances and exhibits, and engage in active participation in all of our sessions. Also, at the last session, participants will each submit a one page proposal for a project that will advance disability inclusion in arts and culture throughout NYC. As you can see, we take this all very seriously, but if the past is any indication, our sessions will be lively, provocative and, we think, a lot of fun! We look forward to reading your application, which is due by February 1, 2019 at 5:00 pm EST. If you have any questions, please email hello@disabilityarts.nyc. Disability/Arts/NYC (DANT) is an arts activist organization building a movement for disability arts to thrive in New York City. Through cultural policy development, cohort-based trainings, and public programming, we work to dismantle discriminatory practices and policies faced by disabled artists, while simultaneously supporting an evolving community of emerging and experienced artistic talent. Photo courtesy of Disability/Arts/NYC (DANT).